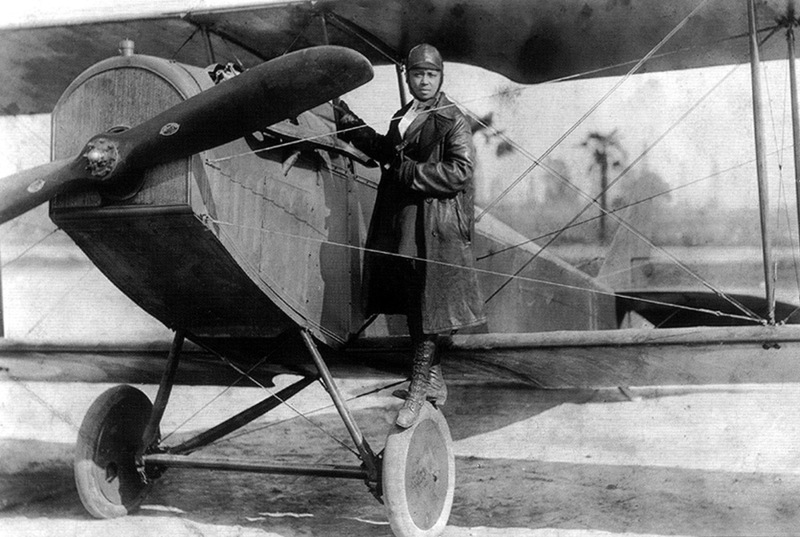 Known for dazzling her audiences as a pioneering aviator, Bessie Coleman swooped into the barnstorming business in 1922. Coleman became the first African American woman in the world to earn a pilot’s license, and made it her business to bust down barriers to ensure a place in the sky for herself and everyone like her who came after. Born to a family of sharecroppers in Texas, Coleman was the tenth of thirteen children. Although her schooling was frequently interrupted by the cotton harvest, Coleman completed eight grades in a one-room schoolhouse before she left to live with her brothers in Chicago. While working as a manicurist in a barbershop, Coleman often overheard the stories of pilots returning home from World War I. She became fascinated with aviation, and longed to pursue a career as a pilot. However, not a single American flight school at the time admitted women or non-white applicants. Facing the reality that there were no pilots in the U.S. who were willing to teach her to fly, she saved her money, taught herself French, and left for Paris, France to follow her dreams. In 1921, she earned her international pilot’s license, and took to the skies – despite these attempts to keep her grounded. In order to make a living as a civilian aviator, Coleman became a barnstormer, a stunt flier, performing daring feats, many of which had never been attempted before. To achieve this, she spent an additional two months in France studying advanced aviation techniques to give her the skills she needed to make a living as a flier. Using borrowed aircraft, Coleman would dip, dive, and spin, occasionally jumping from aircraft mid-flight with a parachute. Her performances earned her a reputation as a masterful and daring pilot who knew how to win over a crowd. Coleman made it her goal to be a leader in aviation. Even her fans referred to her fondly as “Queen Bess.” She famously said, “The air is the only place free from prejudices.” It was her goal to eliminate these prejudices, and she planned to found a school for aviators of every race. She frequently traveled to speak in churches, schools, and theatres to inspire the next generation of African American pilots. In 1926, Coleman died when the plane she was testing suffered a malfunction and crashed in Dallas. While she didn’t live long enough to establish a school for young aviators, her legacy as a trailblazing pilot lives on– several scholarships are awarded in her name each year to youth pursuing careers in aviation. A memorial plaque to Coleman also resides at her former Chicago home, and roads in Chicago, Florida, and Paris are also named in her honor.